We write Java programming assignments for college and university students. Contact us any time, 24/7. If you are looking for an expert to do your Java programming assignment, homework or project, we can help. Our Java programmers are available 24/7 to help you. We provide expert programming support for all types of college & university assignments, homework & projects. Being the premier team in providing Java programming homework & assignment help, we can handle any Java programming assignment topic, at any level of complexity, from basics right up to advanced programming assignments or projects. Our programmers provide accurate solutions to all types of Java programming problems. It is easy to get Java programming help - all you have to do is to send us your Java programming assignment question or topic and let us know when you need it completed & delivered back to you. Accept our quote and pay online to confirm your order. Then, collect your fully completed Java homework alongwith all the necessary instructions and documentation from your email inbox on the scheduled delivery date. We never ever miss a delivery schedule. And the best part - we work 24/7, all round the year. Jump into the Java help chat on our website and discuss your requirements with our super-professional customer success managers, or just drop us an email to info@urgenthomeworkhelp.com and one of our executives will get in touch with you within a few minutes. Need a Java homework, assignment or project done in a hurry? No problem. We provide 24 hour homework help exactly for such situations. Java is an object-oriented computer programming (OOP) language. It is so popular that today, at least 5 billion devices run on it. It is estimated that there are at least 9 million Java developers all over the world. It was built in 1991 by a team of computer engineers from Sun Microsystems. This team was known as "the green team" and was led by James Gosling. Java was initially known as Oak but it didn't get gain a lot of prominence and in 1995, it was renamed to Java. In 2009, Sun Microsystems was accquired by Oracle Corporation. Java has now become the base for creating and delivering online content. Our Java programmers are thoroughly trained in Java and can help with any Java assignment or project. Java programming language can actually be considered simplified version of C++. Java source code files have a .java extension, which when compiled into a bytecode format, changes to .class extensions. These .class java bytecode files can be understood (or executed) by Java interpreters. Computers today come with Operating Systems like MS Windows, Apple Mac OS and Unix that include Java Runtime Environments and Java interpreters in Java Virtual Machines or VMs. Java code can also be converted into machine language by a JIT (just-in-time) compiler. OUR ASSIGNMENT EXPERTS CAN HELP YOU WITH YOUR JAVA PROGRAMMING HOMEWORK. CLICK HERE FOR AN INSTANT FREE QUOTE. WHY DO YOU NEED JAVA PROGRAMMING LANGUAGE? One of the first things Java code helpers will learn is that Java can be used to create full-fledged applications which can be either standalone or something that runs in a server-client setup on multiple computers. Java is much easier to use than C++, though it was developed to replicate the look and feel of C++ itself. When you install Java, you get the JRE (Java Runtime Environment) which comes with JVMs (Java Virtual Machines) along with the Java platform's core classes and supporting Java platform libraries. Java is a special type of program language. In fact it is a programming environment by itself. If you develop an application or computer program in any other programming language, say Cobol or Pascal or Fortran it will run for the environment you created it for - like MS Windows or Unix. If you wanted to get it to run on any other platform, you will have to make appropriate changes to its source code, else it will not work on the new platform. But that is not the case with Java. An application that is created to run on the JRE will run identically on any platform JRE is installed. Which means it will have the same behaviour on MS Windows, Unix, Linux as well. This is actually seen as a security issue by Apple which does not allow JRE to be installed in their iOS based devices. 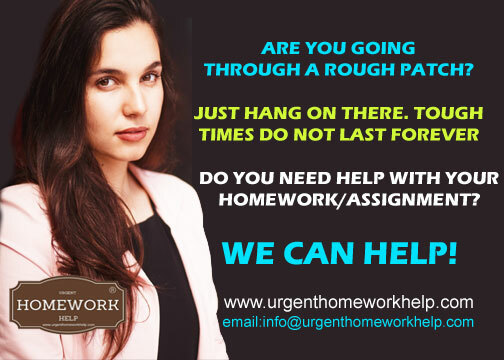 Some students get a little overwhelmed by all these facts and seek out help with java programming from online assignment help experts like UrgentHomeworkhelp.Com - a wise decision and one that can save you a lot of stress and sweat. While you move on to buying Java homework help for your college homework, let's spend a moment trying to understand some of the advantages of having Java programming language in your computer. Java can run on all Operating Systems. With Java you do not have to rewrite programs to run on different environments - you can write a program to run on JRE which will run on all platforms where JRE is installed. Java is used by almost all major anti-virus applications. Java is versatile, it is used in billions of devices today. DO YOU NEED JAVA EXPERTS TO HELP YOU WITH JAVA CODING HOMEWORK? WE CAN HELP. CLICK HERE FOR A FREE QUOTE. Buying Java programming help from us is your guarantee to scoring top marks in your programming language homework, assignments or project. Our Java programmers not only understand how Java itself works, but are also aware of how it was intended to work and its history of updates over the years. This kind of knowledge comes only with years of learning, practice and hands-on experience. We provide Java programming assignments with solutions that will match your specific needs and more importantly, will be error free and function smoothly. So, when you pay someone to write a java program, you have to be sure that you will get the right returns on your investment. With our experts, that is a guarantee. After having written thousands of Java assignments, we are happy to say this: no matter how complex your Java programming homework is, we can do it for you. And we can do it in the shortest possible time, with zero errors. We do programming homework for international college and university students worldwide and we follow unmatched standards of quality to make sure you top in your class. HOW TO ORDER PROGRAMMING HOMEWORK HELP IN 3 SIMPLE STEPS? 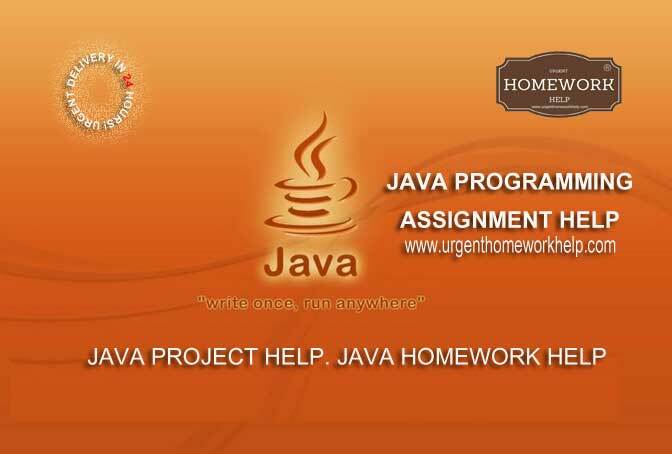 STEP 1: Placing an order for Java homework help is as simple as sending us your requirements using the ORDER NOW form provided in this page, on the right. Just fill in your contact details, add any additional information and attached relevant reference documents, if any, and send it to us. We will review it and contact you right away. You can also email us all your details to info@urgenthomeworkhelp.com. Also let us know when you need it completed. We will send you a free quote as soon as we get details of your homework assignment. STEP 2: Accept our quote by making payment on our website. We will acknowledge your payment and provide you with a Guaranteed Delivery Date, which will be absolutely in line with your deadline for submission. STEP 3: On the Guaranteed Delivery Date, collect your fully completed Java assignment from your inbox and submit it to your institution. That's it! OUR EXPERTS CAN HELP YOU WITH YOUR JAVA PROJECTS & ASSIGNMENTS. CLICK HERE FOR AN INSTANT FREE QUOTE FOR JAVA HOMEWORK HELP. I had almost forgotten about my Java project. Luckily, I got online homework help from this company & I was able to submit my assignment on time. Though, I must confess, I was a little sceptical about their "overnight assignment help" concept but it was a good decision I had taken - to go ahead with them. I would definitely recommend their services to everyone! So glad I chose to buy Java homework solutions from this company. Their customer care rep listened to me carefully and made sure he had all the right information about what I wanted. Then I sent in some reference documents and paid online. That was it! My completed assignment was delivered four days later without any hassle. Thank you, Team.